“It seems to me that people of the present day (1912) do not enter into the spirit of the season as did our ancestors in the “good old days of yore”. I distinctly remember when the approach of “Yuletide” – as we now call it – was hailed with the greatest enthusiasm by all ages and conditions of men, regardless of their surroundings and circumstances. brought this great festival to a close. 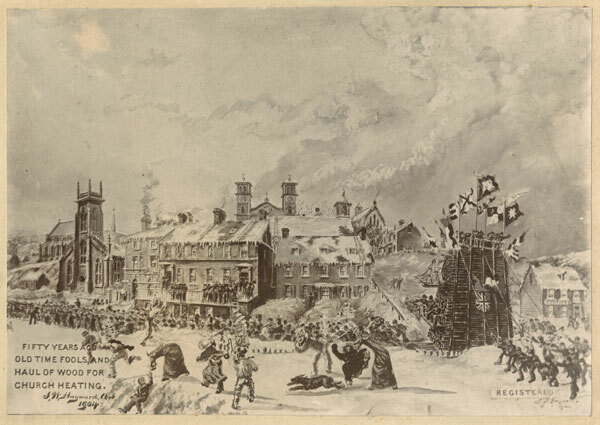 Surely there are citizens here in St. John’s today who can readily call to mind that exciting scene when mummers paraded along that thoroughfare from one end of Water Street to the other. But, within the past few years, these kinds of festivities once appropriate to the day have much fallen off. Mr. Alex A. Parsons, (1848-1932) was editor of the Evening Telegram (1882-1904); and Superintendent of H.M. Penitentiary (1905 – 1925). Wishing you and your families a very Merry Christmas and a Happy New Year. All the very best with the challenges and opportunities that will come in the New Year. This entry was posted in Archival Moments and tagged Auld Lang Syne, Christmas, J.W. Hayward, Mummering, St. Stephen. haul wood on December 21, 2018 by Larry Dohey. An ale at the local tipple. In many communities in Newfoundland– the name assigned to December 23 – has traditionally been Tibb’s Eve also known as Tipp’s Eve and more recently Tipsy Eve. It is the first official day of the Christmas Season. There is uncertainty about the origins of the expression. Folklorists in Newfoundland generally agree that Tibb’s Eve was originally the old-fashioned way to say ‘never’, as in ‘a day that doesn’t exist’. In Newfoundland the expression was “it will be Tibb’s Eve before you get that done.” or “we’ll be at this from now to Tibb’s Eve”. There’s an interview in the Folklore and Language Archives at Memorial University of Newfoundland with a man from a community in Placentia Bay, born in the early 1900s, who asks the student who’s interviewing him when she plans to get married. “She answers, ‘Oh, probably never’ he winks his eye and says, ‘Oh, on Tibb’s Eve,’ and on the tape she has no idea what he’s talking about. For him, a joking way, but a normal way of something that’s not going to happen. The more contemporary explanation of St. Tibb’s comes from the association of the day with a Christmas tipple. 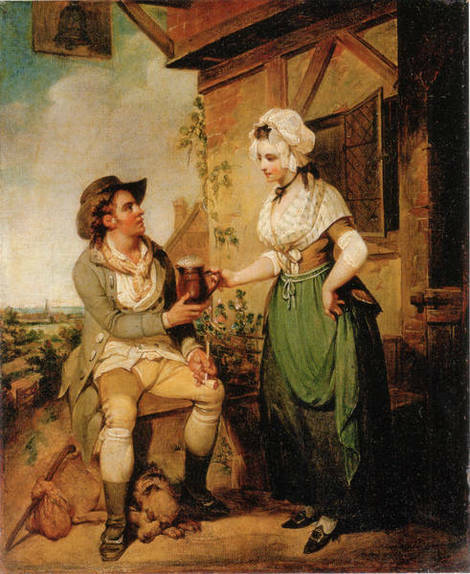 In the 1500’s if you were to go out for a drink you went to a “tipple” or alehouse and were served by a “tippler” the alehouse keeper. In Newfoundland – St. Tibb’s became – the first real occasion to taste the home brew, a day where the men would visit each other’s homes for a taste. The League was not a great success. If you are tippling on Tibb’s Eve – No Driving !! This entry was posted in Archival Moments and tagged Christmas, Tibb's Eve, Tipp's Eve, tipple, tippler, Treating on December 20, 2018 by Larry Dohey. A number of subscribers to the Evening Telegram took on the challenge and penned letters making their positions known and they had very definite opinions. 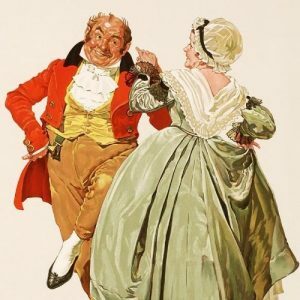 The “Valse” was a relatively new dance in St. John’s and in 1894 considered “the dance”, but it seems “very few people knew how to dance it well.” Today we know the “Valse” as the Waltz . When first introduced into the ballrooms of the world in the early years of the Nineteenth Century, it was met with outraged indignation, for it was the first dance where the couple danced in a modified Closed Position – with the man’s hand around the waist of the lady. In November 1894 all of the “Assembly Halls” in St. John’s were actively advertising for the “dancing season.” The West End Amusement Club was offering “dancing assembly’ every Wednesday night. The British Hall offered “dancing assembly” every Thursday night. It is likely that Mrs. Elizabeth A. Nyle was not amused. My dance card is full. A dance card is a card that was provided at large balls and dances with a list of the dances for the evening with a space beside it. The ladies would each have a card, sometimes with a small attached pencil, and when a gentleman asked her to dance, he would write his name in for a particular agreed upon dance. This was to help the lady remember who she agreed to dance with and to avoid the embarrassing situation of promising to dance the same dance with two different men. This entry was posted in Archival Moments and tagged Christmas, Dancing, party on December 17, 2018 by Larry Dohey. 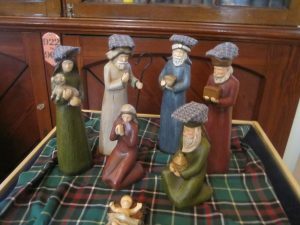 This entry was posted in Archival Moments and tagged Anspach, Christmas, hearth, Junk, log, Yule on December 14, 2018 by Larry Dohey. Hobby Horse one of the traditional mummer disguises. On December 28, 1860, in Bay Roberts, Nfld., Isaac Mercer was strolling home from work with his two brothers-in-law when unexpectedly they became victims of a crew of rowdy masked mummers. The three men were beaten until Isaac Mercer’s body went limp. When the brutes scattered and disappeared into the night, Mercer’s friends, bruised and battered, carried him to help. The next day, Mercer was pronounced dead. The mummers are almost always described as carrying some combination of hatchets, sticks, ropes and whips, all of which clearly have the capacity to serve as aggressive weapons. Court records describe men and women armed with “bludgeons & swabs dipped in Blubber” which they rubbed into their victims’ faces and clothing, as well as swords and “loaded guns”, carpet brooms, blown bladders filled with pebbles, the weapon of choice was a hobby horse, used to charge individuals. “any Person who shall be found… without a written License from a Magistrate, dressed as a Mummer, masked, or otherwise disguised, shall be deemed guilty of a Public Nuisance”. Offenders were to pay “a Fine not exceeding Twenty Shillings”, or to serve a maximum of seven days’ imprisonment (Consolidated Acts of Newfoundland, 1861: 10). Recommended Archival Collection: The Rooms Provincial Archives: GN5 /3/B/19 Box 13, File Number 3 and explore GN 2/1-3 and GN 5. Criminal trials involving mummers and mummering. 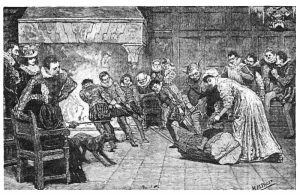 New Term: blown bladders: inflated animal bladder used as a mock weapon by Christmas mummers … chasing people and striking them with whips at the ends of some of which were attached inflated bladders. Recommended Reading: Any Mummers ’Lowed In? Christmas Mummering Traditions in Newfoundland and Labrador. Flanker Press, St. John’s, NL. 2014. Folklorist Dale Jarvis traces the history of the custom in Newfoundland and Labrador and charts the mummer’s path through periods of decline and revival. Using archival records, historic photographs, oral histories, and personal interviews with those who have kept the tradition alive, he tells the story of the jannies themselves. 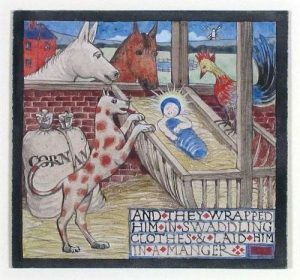 This entry was posted in Archival Moments and tagged Bay Roberts, Christmas, Hobby Horse, Isaac Mercer, Mummering on December 26, 2017 by Larry Dohey. Lost Expression: Haul of wood: a co-operative gathering of fuel (wood) for a clergyman, convent or school. 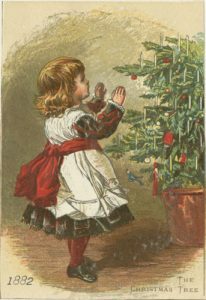 This entry was posted in Archival Moments and tagged Auld Lang Syne, Christmas, J.W. Hayward, Mummering, St. Stephen. haul wood on December 24, 2017 by Larry Dohey. This entry was posted in Archival Moments and tagged Christmas, Tibb's Eve, Tipp's Eve, tipple, tippler, Treating on December 22, 2017 by Larry Dohey.